While heading to and from the reef fishing grounds on 6 hour trips, we are pulling lures at a high rate of speed. We call this technique “high speed trolling.” We use heavier tackle that we can pull at speeds higher than 6 knots all the way up to 15 knots. We have found in years past, that 10 knots is the magic speed for most species like Mahi Mahi, Wahoo, King Mackerel and Bonito. Even though we are moving faster than normal, we must remember that these migratory fish can swim up to 30 mph, so 10 knots is normal for them to strike a lure. We start each fishing trip by heading out through Alabama Point in Orange Beach. Normally, we have about a 1 1/4 to 1 1/2 hour ride to get to where we are going. The migratory fish are anywhere and everywhere during the summer months when water temperatures are warmer. Some days we don’t catch hardly any at all. Some days, we can’t get to where we are going because fish are hitting every mile or so. 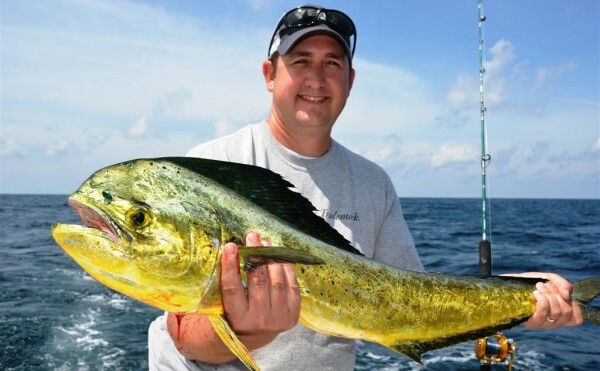 When it comes to Mahi Mahi, they are not as abundant as other species, but they are around. We usually find them while high speed trolling around sargassum weed lines or floating debris.